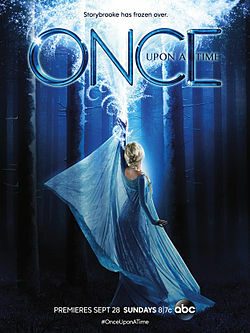 Once Upon a Time is back! And it came back with a handful of questions, new characters and set ups for what look to be exciting story lines. One of my major fears for this season was quickly put to rest from the season catch up that aired beforehand and the episode itself. I can see now that the Frozen storyline is not going to just be a retelling of the Frozen movie which makes me feel better. It actually seems like we are going to get more history of the sister, their families and Elsa’s powers. The show seems like it may answer some lingering questions from the movie and actually add more to the movie itself. After this season’s over or at least this storyline I may watch the movie again to see how it changes how I watch the movie. (Though I do know that nothing in the show is officially part of the Frozen Disney universe but it will still be fun to have this added bit for the movie). We opened the episode with Elsa and Ana’s parents at sea caught in a terrible storm. The mother quickly works to write a message and place it in a bottle. She says it tells the truth (though what that truth is we are not told). We then jump five years and see Ana preparing for her wedding and Elsa still struggling with controlling her powers. This story line is going to take place right after the movie ends it would seem. (If you haven’t seen the movie I watch highly recommend it. Not only to be able to follow the show better but also because it is a great movie!). We are introduced to our new characters and then are brought back to our old favorites. 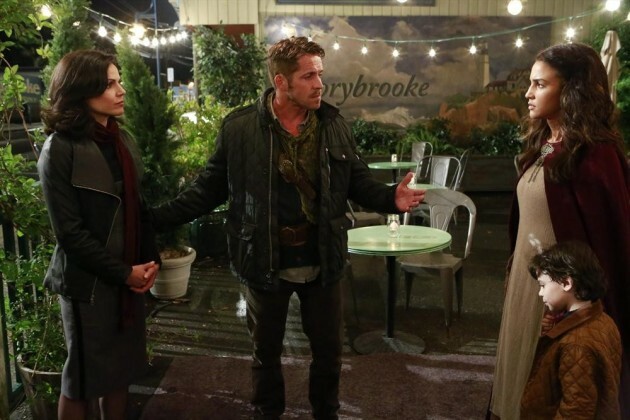 The scene opens right after Emma has brought Marian into the diner and Robin Hood has reunited with her. (Note that there is a time jump between Elsa and Ana’s past story and this moment, though we are not sure how much time has passed between the two yet). Regina leaves the diner, angry and broken hearted. She has just seen that Robin Hood still loves his wife and she has seen her whole world collapse around her once again. She is angry at Emma, angry at the whole situation and her heart is breaking. These are a lot of emotions for Regina to deal with at one time. On top of all that Marian comes out screaming about Regina being a monster. She is upset and confused as to why everyone is defending Regina. She hates her (and I can’t blame her) and she reminds Regina that yet again she is and always will be seen as the villain by someone. She has tried so hard to make herself feel less like a villain and monster but she can’t succeed. She sees yet again that she is not going to get the happy ending that she so desires. She leaves the diner broken and hurt. Regina enacted the curse because she was upset that everyone in the Enchanted Forest seemed to get a happy ending, everyone but her. She wanted to hurt Snow and she wanted to make it so no one can get the ending that she couldn’t have. Over the course of the show we have seen Regina get so close to that ending only to have it ripped out of her reach again and again. She is on her tippy-toes almost having a hand on that moment and then it is yanked away and she stumbles forward and has to start all over again. It hurts and she is done with that pain. She thought she had her ending with Henry but he was distant with her and then Emma shows up and she has to fight for her son’s love. She gets his love and trust and then finds Robin Hood. Only to have him ripped right out of her grasp yet again. She is getting tired of this fight and we can see that she is getting desperate. Henry is like us and worried about Regina going back to her old ways. Whenever she gets upset or angry she falls back into what is comfortable and that is being evil and hurting people. Henry doesn’t want to see that happen to his mother and either do we. I was scared at the end of last season that we would end up with evil Regina again but I don’t think we are going to get that woman. We are seeing a desperate Regina now. She frees Sydney to help her get rid of Marian. She doesn’t want her killed in this world, because it would come right back to her and that would help nothing. She initially thinks about going back in time and killing Marian before Emma can come along but that idea doesn’t last long. Regina quickly realizes her problem isn’t Marian herself. She is just another obstacle being thrown at her and she is tired of weaving around and jumping over these things. She wants what she deserves and she is going to find a way of getting it, one way or another. The plan that Regina comes up with excites my writer’s heart dearly. She is going to find the writer of Henry’s storybook and make him basically rewrite her story. She blames the book for her issues. Everyone’s story is inside of this book. You just have to open it and see what has happened to every one and what has led them up to this point in their lives. It doesn’t tell the future but it holds the past and the past is what Regina wants to get rid of. Time travel is complicated but she is intent on having her story rewritten. The stories in that book are the stories that have created everyone in Storybrooke. They hold everything that has made them who they are up until this point and Regina wants hers fixed. Regina wants her story rewritten so she can actually get her happy ending finally. The problem is I am not sure Regina has a clear idea of what a happy ending truly is. I think she thinks of it has everyone being together and everything working out perfectly with no hurt, no pain and no problems. By that definition no one has gotten their happy ending and never will. Regina wants life to be too perfect and she is going to be upset when she finds out that happy endings are complicated. Plus you can’t get an ending until everything is over and her life is far from over. I think she will start to see that maybe she has all she needs to create that ending and to live happily, right in front of her. The other main character in this episode was Elsa. We see that Elsa is still struggling to control her powers. Her emotions set them off and she is struggling not to freeze everyone and everything. We see that she seems to define herself much the same way that Regina does, as a monster. Both Regina and Elsa have power and aren’t sure how to use it in the right manner. They are both scared of what they can do and have done in the past. They hide themselves away hoping to protect people. Regina hides because of her past and how it can hurt and Elsa hides because she is terrified of what she may do in a moment of lost control. Elsa blames herself for her parent’s death and believes that all her families problems are her fault. We learn that Ana is missing. She went to Misthaven (also known as The Enchanted Forest) to find out why their parens were heading there when they died. Elsa blames herself and is determined to find her sister one way or another. 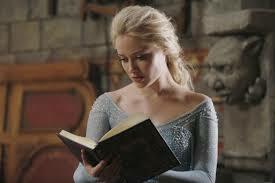 I hope that Elsa and Regina see a kindred soul in one another and become friends of sorts. They both are struggling so hard not see themselves as monsters that they would be able to relate to each other well. I think they can take advice from their friends and family but those people don’t understand their situation fully. Together they can offer advice and an ear to listen to because they know exactly how the other feels. They are both outsiders wanting a happy ending. This season is going to be an interesting one. We are going to continue to see our key characters grow and we are going to get more depth to two characters that many have fallen in love with. Will be interesting to see how everything starts to play out. “Always the villain even when I’m not.”- Regina- No matter what she does her past continues to haunt her. She is tired of being seen at the villain which is why she decides to rewrite her story. “Left my past in the past where it belongs.”- Robin Hood- He knows your past may hurt and it can hold things you are not proud of but you can change. He hopes Regina can understand this. Even though his past love is now alive again so that statement got a bit complicated. “There is always a crisis,”- Hook- I feel like Emma is going to hide behind this idea for a while. She likes Hook but she is scared, as always. If he gets close he can hurt her and she will do anything to prevent that pain. “We have one answer and more questions.”- Anna- Sums up this show pretty well. “You can have happiness […] You have to fight.”- Emma- She says this to Regina hoping to make her see that the world isn’t ending around her. This encourages her to fight, just not in a way that anyone probably foresaw. What were Elsa and Ana’s parents going to do in The Enchanted Forest? – looking for answers about Elsa’s power? – Will we learn the source and reason for the powers? If the author rewrites it can it really help Regina? – Will altering her story actually giver her a happy ending? – Does she already have some form of a happy ending with her son and her friends? – What else does she want? – What will altering the book do to everyone else? Will Emma let herself get close to Hook ever? – Or will she always find an excuse? -How long will Hook stick around if she stays at arms length all the time? Will Elsa and Regina get closes because of how similar they are to one another? It was confirmed that what Rumple pulled out of the box thing was in fact Mickey’s hat from The Sorcerers Apprentice from Fantasia. – So what does it do? – Why was it hidden as it was? – Is it a source of power? -Rumple seems to know about it, so what connection does it have to him? – Why is it the hat? – What is Rumple going to do with it? Posted on September 29, 2014, in Once Upon a Time, Tv Shows and tagged Elsa, Frozen, monster, Once Upon a time, Regina, review, stories, tv show. Bookmark the permalink. Leave a comment.